It&apos;s November! Time to break out the sweaters and blankets! 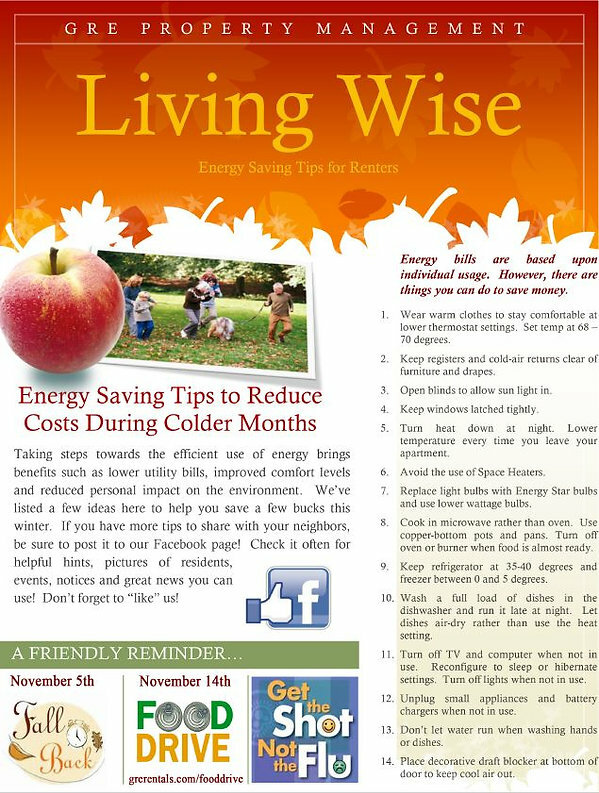 Which is one of the money-saving suggestions you might just find in the month&apos;s edition of Living Wise! Along with those important, money-saving tips, we&apos;d like to draw your attention to the notice about a November Food Drive. Please donate any non-perishable food items to help other Central Illinois neighbors in need. Do you have your flu shot yet? Don&apos;t forget! Stay proactive and stay healthy! Manylocal retail pharmacies have them available for very little cost! #WorthIt! Thank you for reading, don&apos;t forget to follow us on Facebook @GRErentals and @HaymeadowApts. And if there are items you&apos;d like us to cover in future editions of Living Wise, please email Marketing@GRErentals.com!